My daughter is in Year 1 and goes to school about 1.5 miles from our home. A journey that’s almost always going to be easier, quicker and cheaper by bike than any other means. When she started at school, aged 3, half-days at nursery, the journey involved a tedious drive through suburban Carshalton & Hackbridge. Sometimes we’d take the bus, once or twice when the weather was good we walked/scooted. Mostly, we drove. A full school day begins when you enter Reception Year, aged 4. Starting ‘big school’ is a momentous day in the life of any child/parent and happily she seemed to take the step-up to a full school day in her stride. The school commute remained the same though until summer 2013, when April learned to ride a bike. I’d told her when she had learned to ride a bike, we could cycle to school. So most days, that’s what we do, we cycle to school. We didn’t start cycling to school in order to write about it, but because it’s better in almost every way than the alternatives. April and I spend time together talking, we see and feel the changing of the seasons, she gets a little exercise and arrives at school with a sharper mind, ready for her day at school. She is partially taking responsibility for her own journey and learning independence too. At the same time, her commute is making other people’s lives better. There’s one less car on our congested streets, and a bit less pollution in our already poor quality air. If London Borough of Sutton were to make a commitment to provide Space For Cycling more people would choose to make all types of different journeys by bike. 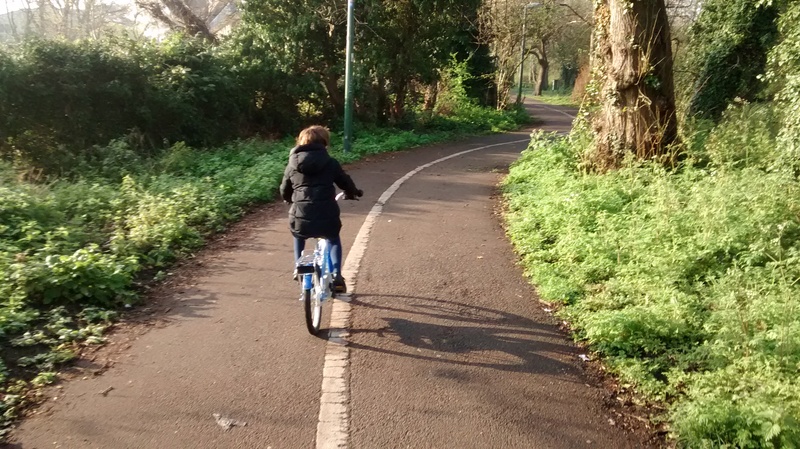 This is going to be a regular update of what it’s like to cycle to school with a young child – the advantages to cycling, the barriers that are preventing more people from choosing a bike as means of travel. With some foresight, political will and commitment, London Borough of Sutton could be cleaner, safer and healthier for us all. ‹ Sorry, am I in the way?